PlanetSide 2 has really nice clouds. As they bubble up over the rust red mesas of the Indra continent they occlude the sun, casting undulating shadows in realtime and leaking ghostly, shimmering rays. If you care to hop into an aircraft and point your nose up, you can lose yourself in the fogbank – which may be a hazard or a blessing depending on who’s chasing you. This would sound like puff if it weren’t true. 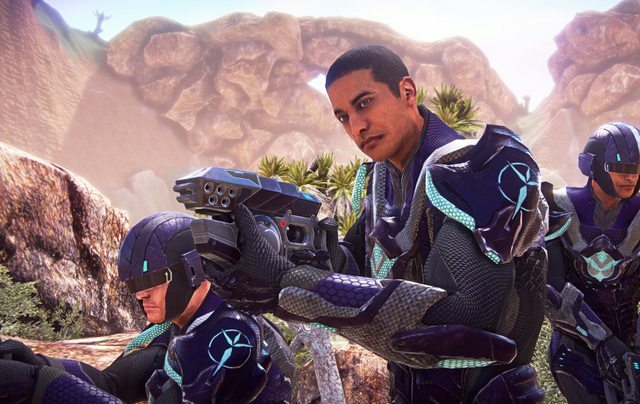 Like the original game, PlanetSide 2 is set on an open world of sprawling, diverse continents. 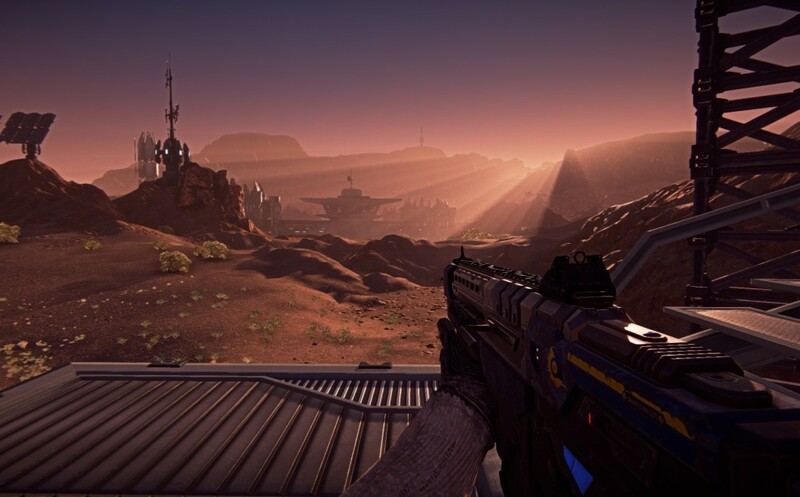 This is the planet Auraxis, contested by the game’s three violently opposed factions. And that planet is there for more than just scene-setting – it’s as much a weapon as any sidearm. The terrain may look fresh from Mother Nature’s oven, but it’s been attentively tweaked to break lines of sight, to allow for cover and clever tactics. More pictures and text there. It's come a long way since I first posted news of Planetside 2 here, with the worries about EVE-style levelling and pre-set classes. Seeing the sheer scale and ambition behind it now, compared even to the original Planetside, makes it somewhat understandable that they dropped the cert system. The amount of variables they're having to juggle just with classes already sounds ridiculous. Additional screenshots can be found...Here. We all knew it would be pretty and big. The very last sentence about guns having a better feel is very encouraging though. There's a second page you missed. It does talk a lot about the graphics on the first page, which are gorgeous "for an MMO" (despite what T-Ray says), but it also speaks about the hand-crafted terrain. I know it sounds like the typical game-dev hyperbole, but in this case every tree, rock and hill is being purposefully placed to accommodate good fights. For maps the size of Planetside's that's a huge amount of effort. I always whined about how everyone could immediately swap to what they needed to kill you, and I see that's still kind of there with the ability to go swap classes... but since the classes have their own skill trees it's not as easy as just throwing another weapon on and since he talked about respecs being available through microtransactions I assume even at class level they are making decisions that limit availability or at least application. Better than expected. “Light assault is basically the ‘glass cannon’ character. He can do the most damage the quickest. He’s very agile, but it’s also very vulnerable. I am suddenly excited... this is what I wanted in Planet-Side when I was tired of my stealther. I was used to being squishy, but I wanted more direct offense. Even in agile though I had no real advantage vs a heavy armor with more inventory even if technically a bit faster. I also really hated some of the weapon graphics, and it's nice to know whatever I decide on I'm sure I'll be able to swap in a few things to make it look decent. Last edited by VKhaun; 12-05-2011 at 02:08 PM. Last edited by Pyrrhus; 12-06-2011 at 09:36 AM. Cannot hotlink from PSU. Reupload with Imgur or something. The old PS was a blast, I will definitely check this out. PS had the only worthwhile MMO PvP IMHO. Picture. In regards to the base in the distance these prowlers are apparently "well within striking distance". That TR rifle looked nothing like the ones we saw above. I wonder if that wast he common pool rifle or if customization is really that extensive. I'm fairly sure it's a different weapon. I think customization will be pretty extensive, but there isn't a single part of that gun that's the same. Also got told this today. The forgelight engine continues to impress. And another picture. Maybe I just missed it before, but it's new to me. Yes, the lead art designer was also the guy who did the art for Fallout, hence the resemblance.